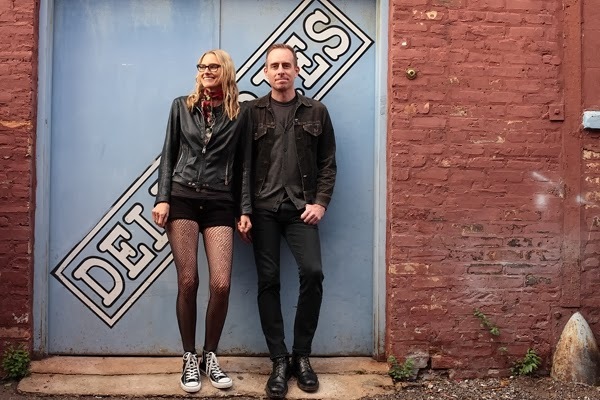 The Both, a new duo consisting of Aimee Mann and Ted Leo, will release their debut album The Both on April 15th through Mann's own SuperEgo Records. In advance, we're premiering the outstanding "Milwaukee," a hook-injected rocker with great soloing and an unwavering beat. "Walking along Milwaukee's riverfront between sound check and show time last year, Aimee and I were startled by a very disconcerting bronze statue of Arthur Fonzerelli, a.k.a. 'The Fonz,' a.k.a. 'The Bronze Fonz,'" Leo tells Rolling Stone. "In that very moment, we knew we had to start a band to immortalize it (more than a bronze statue already immortalizes something), and the Both was born. "I think the song is a pretty good representation of how our writing meshes on this project – solid melodies and tight harmonies, forward movement but not going off the rails, some busier rocking parts meeting some spookier atmospherics, etc. And it speaks specifically of our friendship and some of the things that honestly did lead us to want to begin writing together." The Both represents the pairing of two great if under-appreciated talents who go great together. When the two artists toured together in 2012, Leo's solo sets inspired Mann, the headliner, to hop onstage with him. From there, the 11 original songs on The Both were written with a back-and-forth process and recorded in L.A. throughout 2013 with producer Paul Bryan, who doubles as a member of Mann's band. Leo's roots are in the punk and indie movements, having fronted Ted Leo and the Pharmacists for 15 years. His most recent set, The Brutalist Bricks, was released on Matador in 2010. Mann's eighth album, Charmer, was released in September 2012. In support of their new disc, the Both will launch a U.S. tour at Pearl Street in Northampton, MA on April 24th. Tour dates are available here.